Whoa, Nellie! – Tell my story. Nellie Browning Mills (1876-1964) was never Emmett’s official secretary, but she did work for Emmett as she was the main stenographer and typist at the San Carlos Hotel in Pensacola, Florida from 1910 to at least 1917. Emmett used Nellie’s shorthand and typing services when he stayed at the San Carlos Hotel during the years 1914-1916, while he was was home from Washington, D.C. During this time, his ‘home address’ was actually the J. Walter Kehoe residence. 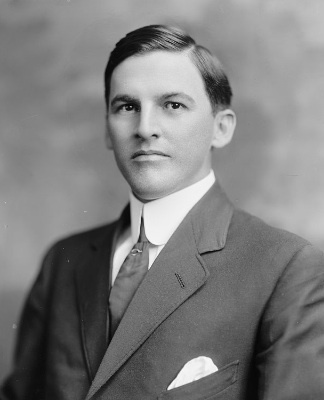 But, Kehoe had decided to run for Emmett’s congressional seat when Emmett ‘decided’ in early 1915 not to run for a third term — so to avoid conflict of interest, Emmett stayed at the San Carlos. I found three different business letters that Emmett sent to his private secretary in Washington, Jefferson Davis Stephens, with stenographer’s initials “NBM” on the lower left hand side of the page. It wasn’t difficult to track down the person with the initials “NBM”; I confirmed that Nellie was “NBM” by reading several copies of the Pensacola City Directory, and she was, indeed, the only professional stenographer in Pensacola with those initials. This became newsworthy — and garnered a story in Colliers! Source: Colliers Magazine, July 25, 1916, via Google Books. So, who was Nellie Mills? Nellie was born and raised in Montgomery, Alabama, and attended Massey Business College. She apparently was one of their star students, because she remained after graduation to teach typing and shorthand (eventually running the shorthand department) for about six years. Apparently, Nellie was not just a popular secretary at the San Carlos; she was liked and well respected enough to have been nominated for Mardi Gras Queen in 1915! Alas, Nellie didn’t win — Gladys Pierce did. But the fact Nellie was nominated and supported by so many locals speaks volumes of the esteem in which she was held. The last record I have for her is the Florida Death Index listing, which indicates she died in May, 1964. I’d love to know more about this interesting person who used to work with Emmett.